According to the 2000 Census, Kenai Peninsula Borough, Alaska has a population of 49,691 people. Of those, 42,841 (86%) are White, 229 (467%) are Black, and 1,087 (2%) are Latino. 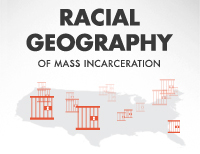 However, 825 (or 2% of the 49,691 people) are not residents by choice but are people in prison. A more accurate description would not include the prisoners. This would give Kenai Peninsula Borough a population of 48,866 with a demographic that is 87% White, 0% Black, and 2% Latino.